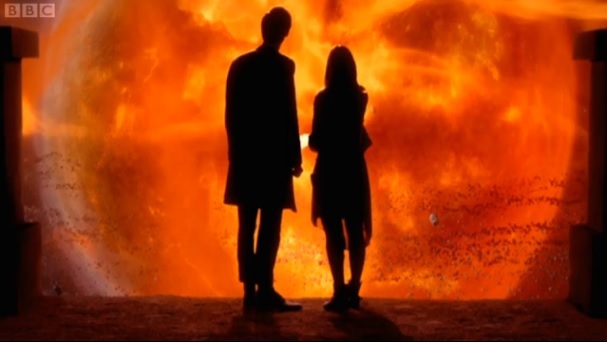 It's been a while since I've blogged on the topic of Doctor Who, but I felt tonight's episode held some exceptional points that I wanted to reflect on. Now I know some of the physics was a bit dodgy to say the least... and the main antagonist very much reminded me of Wilson the volleyball from Cast Away, but the acting and philosophy in the episode were great. The essential plot revolved around a group of alien species who inhabit a cluster of asteroids that nestle within the rings that surround a red sun. Every thousand years the species gather to pay emotional tribute to a sleeping "god". The most important person in the ritualistic festivities is the Queen of Years, whose job it is to lead the gathered pilgrims in a song of lullaby that keeps the god asleep... thus allowing life in the Rings of Akhaten to continue. The current Queen of Years is a little girl named Merry, who is afraid of her inadequacy in the role thrust upon her. Her fears appear to be justified when she is pulled into the pyramid on the asteroid where the god is presumed to sleep and confronted by a vampiric alien that is stirring from slumber, hungering for her song - her soul. Burdened with the knowledge that her people may die if the god is not appeased, she is petrified and yet willing to sacrifice herself to the beast. The Doctor recognises the beast for what it is however, a parasite that leeches on emotion and will not allow Merry to throw her precious and unique life away, to merely satiate the creature for a time. The creature is apparen00tly defeated when it releases a beam of some kind of energy into the sun... and The Doctor, Clara and Merry prepare to make their escape. There is unfortunately a catch. The creature was not the "god". In fact the god is the sun itself, that hungers for the souls and songs of the people... and The Doctor realises the enormity of his error as it begins to become unstable, threatening the life of all who inhabit the rings. "Can you hear them? All these people who lived in terror of you and your judgement; all these people whose ancestors devoted themselves... sacrificed themselves to you. Can you hear them singing? Oh you like to think you're a god.... but you're not a god, you're just a parasite eating now the jealousy and envy and... longing for the lives of others, you feed on them. On the memory of love and loss and birth and death and joy and sorrow. So... so... come on then. Take mine. Take my memories. I hope you've got a big appetite because I have lived a long life and I have seen a few things. I walked away from the last great Time War. I marked the passing of the Time Lords; I saw the birth of the Universe and I watched as time ran out, moment by moment until nothing remained - no time no space... just me. I walked in universes where the laws of physics were devised by the mind of a mad man. I have watched universes freeze and creation burn. I have seen things you wouldn't believe. I have lost things you will never understand and I know things... secrets that must never be told and knowledge that must never be spoken... knowledge that will make parasite gods BLAZE! SO COME OOON THEN! TAKE IT! TAKE IT ALL BABY! YOU HAVE IT ALL!" Yet it is not enough... and as the Doctor slumps, the sun expands once again. Clara has an epiphany and realises that she possesses something even more precious. She holds an autumn leaf whose falling brought her parents together and was regarded by her father as "the most important leaf in human history". She remembers her mother's promise to come whenever she was lost... and how that promise had been snatched away from her when her mother died. Flying back to the pyramid asteroid (I'm assuming the space scooters have some kind of ambient oxygen life support field), she holds out the leaf and points out what it represents - not memories of a life lived, but an eternity of what if's - possibilities that never came to pass because of what happened to her mother - days that should have been and never were. Completely overwhelmed by the influx of experiences and emotions that never were and gorged beyond its ability to satiate itself, the sun collapses in on itself... never to demand sacrifice ever again (major physics goof as the sun's destruction would result in the end of all life in the system). As the Doctor put it: "Infinity is too much... even for your appetite"
I know that with its theme of a jealous false god who greedily consumes the sacrifices and faithfulness of his followers, many saw the episode as a vitriolic attack on religion - particularly as The Doctor gives gentle digs at the people's belief that Akhetan is where the universe began... citing it as a "nice story" and reiterating the scientific explanation for the birth of the universe (something that I as a Christian have no problem with). However I found myself quite spiritually inspired by this story. Therefore, just as sin entered the world through one man, and death through sin, and in this way death came to all people, because all sinned—To be sure, sin was in the world before the law was given, but sin is not charged against anyone’s account where there is no law. Nevertheless, death reigned from the time of Adam to the time of Moses, even over those who did not sin by breaking a command, as did Adam, who is a pattern of the one to come. Into this hopeless fray stepped hope itself. Jesus is a human - He shared in our sorrows and our sufferings and yet being in very nature God, He was not automatically subject to our brokenness. Jesus Christ represents everything we should have been, everything we could have been if we had not followed the pattern of the World. Jesus represents the obedience of all humanity... that never was. In Jesus there's quite a difference isn't there? There's an awful lot of sin but there's an infinity of righteousness on offer. Infinity is too much, even for death's appetite. "Consequently, just as one trespass resulted in condemnation for all people, so also one righteous act resulted in justification and life for all people. For just as through the disobedience of the one man the many were made sinners, so also through the obedience of the one man the many will be made righteous." Not for nothing did Jesus use the Greek word "Tetelestai" (which the English usually translates to "It is finished"), as he died on the cross. It is a word that means debt is paid in full. That's our debt... we can have it paid. All we need to do is put our trust in the risen Jesus and accept what he did for us. Jesus is too much... even for sin and death's appetite.